J McRae (father), Waihao Downs, via Waimate, NZ. Old Waimate Cemetery, Waimate, NZ. On Memorial wall, Timaru, Memorial archway & Gate at Waimate Gardens. 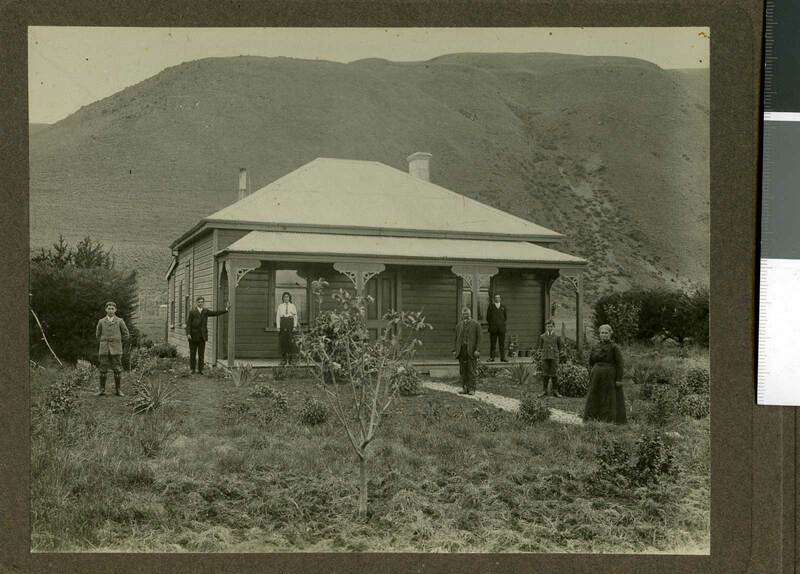 Born 12 July 1893 to parents John McRae and Annie McIntosh, nee Grant, Tokarakhi, Otago, NZ. John and Annie were both born in Inverness, Scotland. John, b about 1862, d 12 June 1928. Annie McIntosh Grant b 1860, d 1932, is the daughter of Donald Grant (1833-1919) and Isabella Ewing (1849-1926), Grand daughter of Peter Grant (1797-1869) and Anne Hannie McIntosh (1812-1897). John and Annie are on NZ Electoral Rolls 1896, 1900, 1905-06, 1911, 1914, 1919, 1928. In Waitaki District, Otago. Both John and Annie are buried in the Old Waimate Cemetery, Waimate, S Canterbury. Donald Grant McRae a Presbyterian. Donald worked at home as a Shepherd, working for his father at Waihao Downs, via Waimate, South Canterbury. 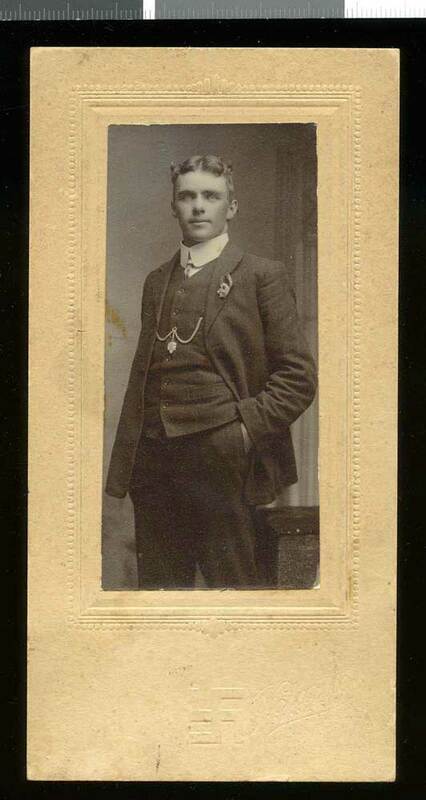 He enlisted 7 May 1917. Serial no 73510. At enlistment he was described as being 5ft 4 ½ inches tall, fresh complexion, blue eyes and dark brown hair. Age was 23 years. He left NZ 10 July 1918. Initially a Private and serving in NZEF, 40th Reinforcements, E Company. Donald’s rank when he was discharged (Sept. 1919) was Rifleman. He was serving with NZ Rifle Brigade at this time in France. A medical examination noted he had had a perforation of the right ear drum for 18 months, and gunshot wounds right side of head and chest. From July 1921, Donald received treatment for ‘Spinal Caries’ at Waimate Hospital. From his return home he did not work again due to injury received overseas. Relatives commented that it was the result of being gassed. 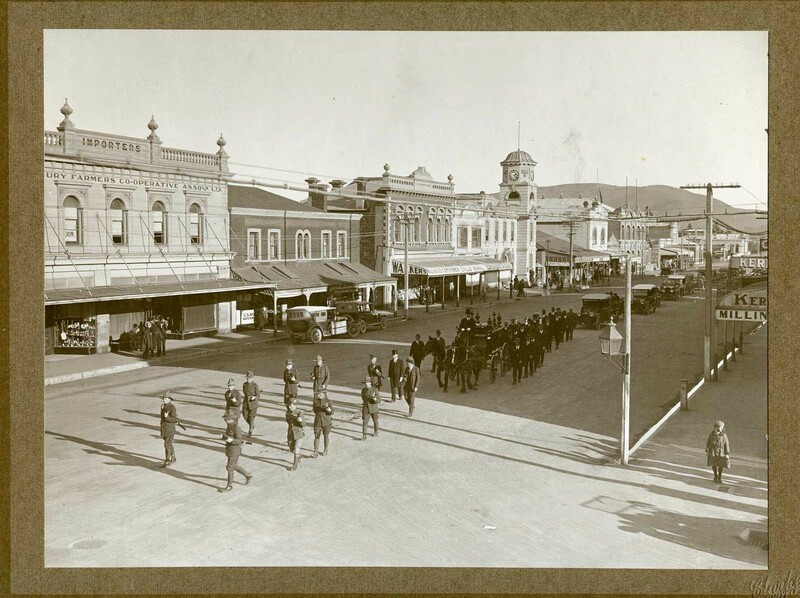 Death occurred in Waimate, South Canterbury, on 25 May 1922. He was given a Military Funeral in Waimate. He is buried in the Waimate Old Cemetery, Plot 000631, in the Presbyterian section. Donald Grant McRae appears on the NZ Army Reserve Roll, 1st Division, S Canterbury 1916, NZ Army Nominal Rolls 1914-1918 WW1 (occupation Shepherd), and NZ Army WW1 Roll of Honour 1914-1919. Donald Grant McRae is remembered on the Cenotaph, Queen street, Timaru, and in Waimate on the Memorial Gates to the Gardens. CenotaphSources: • Auckland War Museum – Cenotaph. 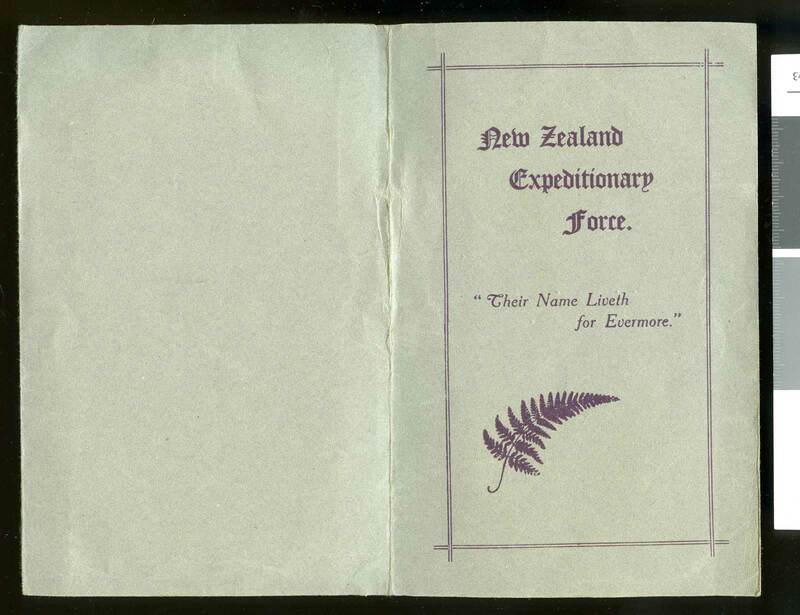 • Archives NZ – Defence Force Personnel Record. • NZ BDMs. • Waimate District Council – Cemetery Database. • Ancestry – Public Member Tree of ‘Ferguson/McClung and related Families’. Grant family history. Many photos from this file. 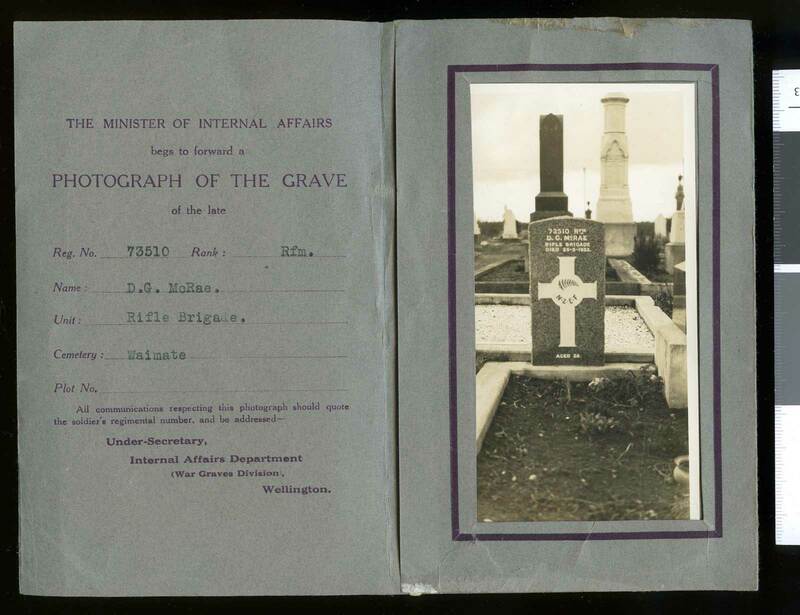 • Ancestry – NZ Electoral Rolls and NZ Army WW1 Reserve Rolls, NZ Army WW1 Nominal Rolls, and NZ Army WW1 Roll of Honour. • Photos from niece Jennifer Love, nee McRae.